Southwick House is located to the north of Portsmouth and was built in 1800. In 1940 when the Thistlethwayte family owned the house, they allowed the Royal Navy to use it to accommodate students from HMS Dryad in Portsmouth Dockyard. Colonel Evelyn Thistlethwayte was the squire of Southwick Estate and owner of Southwick House. Whilst he had loaned the house as a dormitory to the students of HMS Dryad, the estate was still very much a family home and Colonel Thistlethwayte enjoyed the company of the Admirals that he invited to share the game shooting his estate could offer. Whilst enjoying the shooting the admirals took note of the splendid position of the beautiful Georgian house, a stone’s throw from Portsmouth but sheltered behind the hill and its forts and they requisitioned it in 1941 to become the new home of HMS Dryad. Then, in 1943 the house was chosen to be the location of the defence command post of the Supreme Headquarters Allied Expeditionary Force, because of this, HMS Dryad was moved out of the house. In 1944 in the months leading up to D-Day, the house became the headquarters of the allied command. Most of the planning for D-Day took place near London but at the time when the D-Day landings were launched the Allied Commanders wanted to be closer to the assault troops and the ports from which they would leave and so the headquarters was moved to Southwick House. The decision to launch D-Day was taken here. After the end of World War II HMS Dryad remained on site, and the house became the wardroom. In 2004 the functions of HMS Dryad were transferred to HMS Collingwood and the site reverted to its original name of Southwick Park and is now home to the tri-service Defence College of Policing and Guarding. The museum of the Royal Military Police is also housed on site. 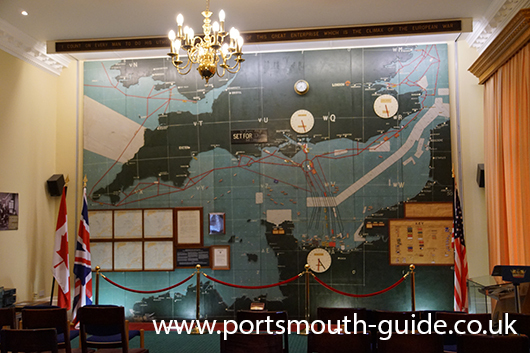 The large map that was used to plan D-Day is still in place in the house and can be visited on special occasions. It was announced in November 2016 that the site would close in 2025.